When the Restoration started the columns were covered with a cement-based plaster stucco that dated to the duPont ownership period. When this stucco was removed, only small traces of the original Madison stucco were seen and no evidence was found that revealed how thick the plaster had been or if it was painted. 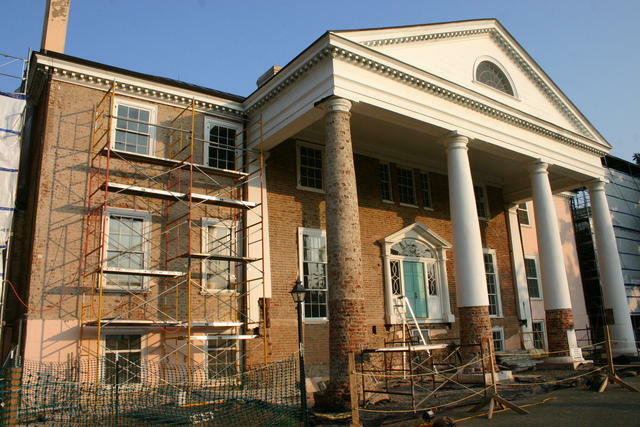 Because this information would be needed to accurately restore the columns, the Restoration Team turned to Montpelier’s archaeologists in hopes that evidence for the Madison-era column finish could be found in the ground. The masons started to remove the stucco from the columns soon after the Restoration started.